Sometimes the secrets we keep to protect ourselves can be our undoing. To all who know her, Annalise Decker is a model wife and mother. She’s a permanent member of the PTA, never misses a sporting event, and is constantly campaigning for her husband’s mayoral race. No one knows that Annalise was once Deidre O’Reilly, a troubled young woman whose testimony put a dangerous criminal behind bars. Relocated through the Witness Security Program to the quaint harbor town of Deep Haven, Deidre received a new identity and a fresh start, which began when she fell in love with local real estate agent Nathan Decker. Twenty years later, Annalise couldn’t be more unprepared for her past to catch up with her. When Agent Frank Harrison arrives with news that the man she testified against is out on parole and out for revenge, Annalise is forced to face the consequences of her secrets. Will she run again, or will she finally find the courage to trust those she loves most with both her past and her future? Susan May Warren is the RITA award-winning novelist of over thirty novels. A five-time Christy award finalist, a two-time RITA Finalist, she’s also a multi-winner of the Inspirational Readers Choice award, and the ACFW Carol Award. A seasoned women’s events speaker, she’s a popular writing teacher at conferences around the nation and the author of the beginning writer’s workbook: From the Inside-Out: discover, create and publish the novel in you!. 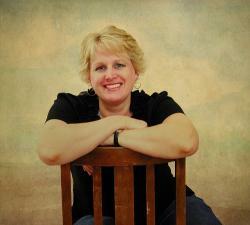 Find out more about Susan May at http://www.susanmaywarren.com/.. This story line was really unique and, although, I usually prefer historical fiction, I was really intrigued by Annalise and the Witness Security Program story. And I wasn't disappointed! This book was really well-written and really held my attention throughout the whole book while reminding me of some great Christian lessons: to trust God and to have courage in the face of adversity! I really recommend this book, especially if you like modern day Christian fiction or a unique and exciting story! Susan May Warren is one of my favorite Christian authors and she definitely proved her talent as a Christian writer again! Win a $200 Weekend Getaway from @SusanMayWarren! RSVP for Facebook Author Chat Party on Oct. 23rd! 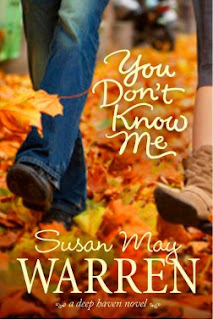 Welcome to the campaign launch for Susan May Warren's latest offering in her beloved Deep Haven series, You Don't Know Me. Susan is celebrating with a $200 Weekend Getaway Giveaway and hosting a fun video Author Chat Party! Enter today by clicking one of the icons below. But hurry, the giveaway ends on October 22nd. Winner will be announced at the ”You Don’t Know Me” Author Chat Facebook Party on 10/23. Connect with Susan for an evening of book chat, Deep Haven trivia, and a live video chat! There will also be info about Susan’s BookShout read-along and a chance to win gift certificates, books, and other fun prizes! Don't miss a moment of the fun, RSVP today. Tell your friends via FACEBOOK or TWITTER and increase your chances of winning. Hope to see you on the 23rd!